In March 1992, the 'forbidden' kingdom of Mustang was opened to the outside world. Now, for the first time in recent history, foreign travelers are a ble to visit La Manthang, the seat of an ancient kingdom dating back to the 15th century. The Kingdom of La is situated along the north central border of Nepal north of the main range of the Himalaya's in the upper reaches of Mustang District. Lo and the area directly to its south, called Baragaon, which both fall within Upper Mustang, can be claimed as one of the most outstanding areas of the Himalaya. 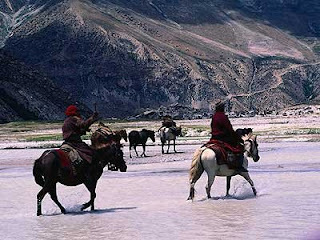 The people of Upper Mustang are called Bhotias and those from Lo are called Lobas. They speak various dialects of Tibetan. Historically, their art and culture flourished due to contact with traders, monks and religious masters passing between Tibet and India, or between Ladakh and Bhutan. The climate and geography of Upper Mustang are nearly identical to those of Western Tibet and as such, they are dramatically different from the temperate and tropical areas of the south side of the Himalayas. The dry, wind swept ecology of this Trans Himalayan region is extremely fragile. Fuel wood is virtually non-existent, water is scare, the agricultural lan d yields insufficient food grains and the marginal and grasslands support only limited numbers of livestock and wildlife. With the influx of tourists, the already pressured desert environment risks further degradation. In addition, although the culture has flourished in contact with other religious and cultural centers of the Himalayas, its sudden exposure to other worlds beyond its high plateau may create a negative impact on the society. In order to keep the destructive environmental and cultural impact of tourism in Upper Mustang to an absolute minimum, the Ministry of Tourism has decided to develop the area as a model eco-tourism area. The Ministry of Tourism, has proposed that part of the revenue generated from trekking royalties to Upper Mustang, US$700 (per person) for 10 days and US$70 (per person) for each additional day, be earmarked for use in UMCDP to sponsor environmental and cultural preservation efforts and community development works. An Upper Mustang Development Fund has been established with the financial support of the Ministry of Tourism and the American Himalayan Foundation, to raise the living standard of the people living in Upper Mustang area. The main aim is to carry out development activities in the remotest villages. UMDP's areas of operations are centered around agriculture, animal husbandry, health and education.